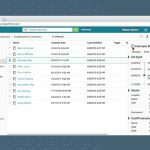 Accounts Payable Streamline |Associated Grocers, Inc. Contributed by: Faron Kraemer, Assistant Accounts Payable Supervisor, Associated Grocers, Inc.
Associated Grocers, Inc. (AG) provides a full line of services such as procurement, marketing and merchandizing to more than 210 independent retailers in Louisiana, Mississippi, and Texas. Before Laserfiche, the accounts payable (AP) process involved printing, manually collating and physically filing invoices, payments and supplemental information. Here is how Laserfiche Avante, in conjunction with Laserfiche Quick Fields, enabled AG to optimize and automate this process. The majority of the invoices originate in the Electronic Data Interchange (EDI) format. Batches of these invoices are printed to the “Accounts Payable – Snapshot Inbox” folder in Laserfiche using Laserfiche Snapshot, a tool for converting electronic documents into TIFF images. Separates each invoice from the batch. “OmniPage Zone OCR” is used to detect when the page number is “1” so that Laserfiche Quick Fields knows that it is dealing with a new invoice. 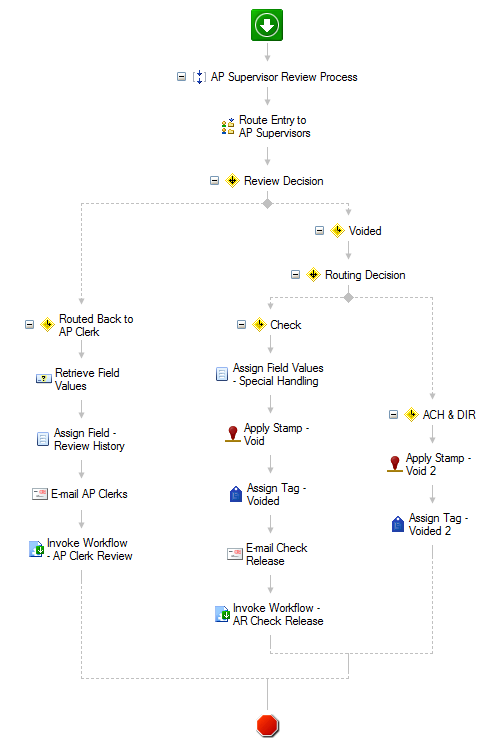 Assigns the “AP Inventory Invoice” template. 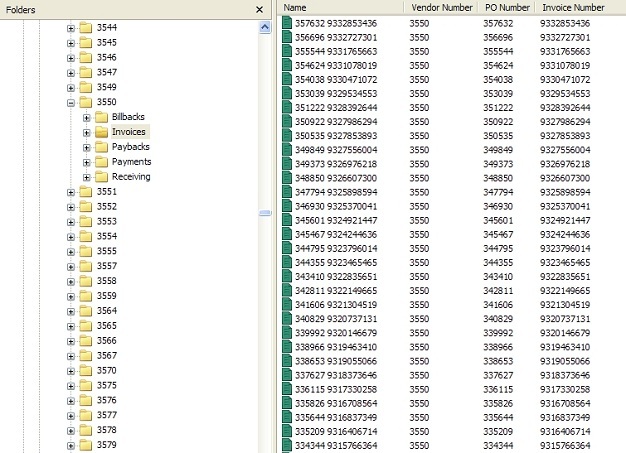 Populates the vendor number, purchase order number and invoice number fields with data extracted from the documents. 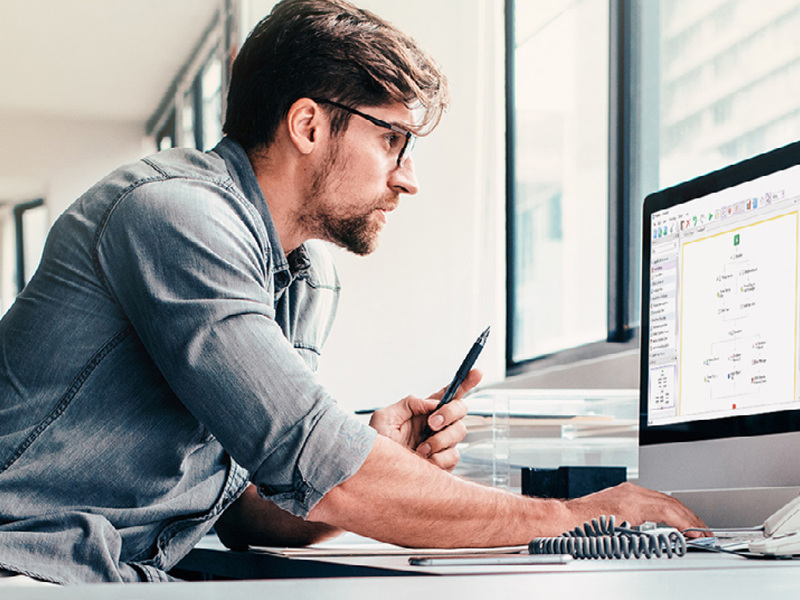 The AP clerk prints invoices that arrive by e-mail to Laserfiche with Laserfiche Snapshot, manually assigns the “AP Inventory Invoice” template and enters the metadata. Invoices that arrive by mail are scanned directly into Laserfiche and the field data is manually entered by the AP clerk. Supplementary receiving documents (similar to packing slips) are all prepped and scanned as a single batch with Laserfiche Quick Fields, which automatically separates each receiving packet and indexes both the vendor number and purchase order number. The “OmniPage Zone OCR” process is used to extract two bits of text that always appear on the first page of the receiving documents. Since the last page of the receiving documents has the same header as the first, the second zone is used to differentiate between the first and last pages. After being processed by Laserfiche Quick Fields, all of the invoices and supplemental materials are stored in the appropriate vendor folder in Laserfiche. AP uses both an invoice list in the PROMPT reconciliation software and a custom “open purchase orders” report to know which invoices need to be worked. The AP clerk searches for each invoice using the purchase order number. 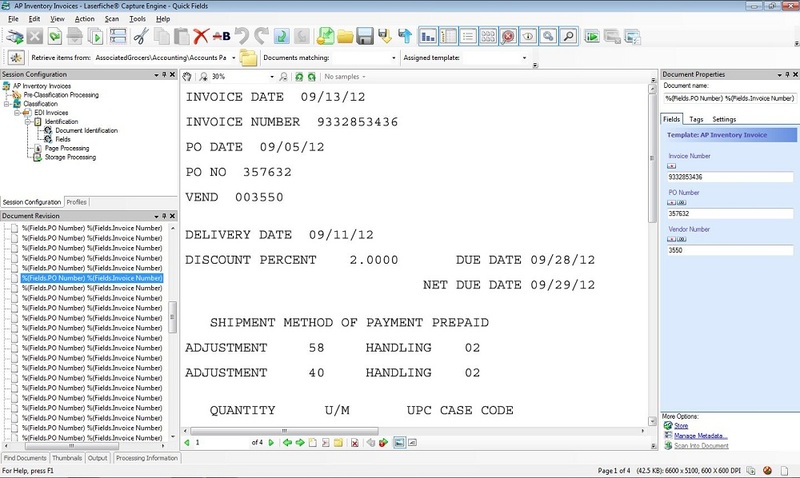 The clerk links the invoice and receiving documents in Laserfiche using the “Link” option in the metadata pane. Once the invoices are reconciled, the payments are then generated by our Lawson Financials software, and a remittance copy is scanned into Laserfiche and indexed by vendor number, payment number and date. 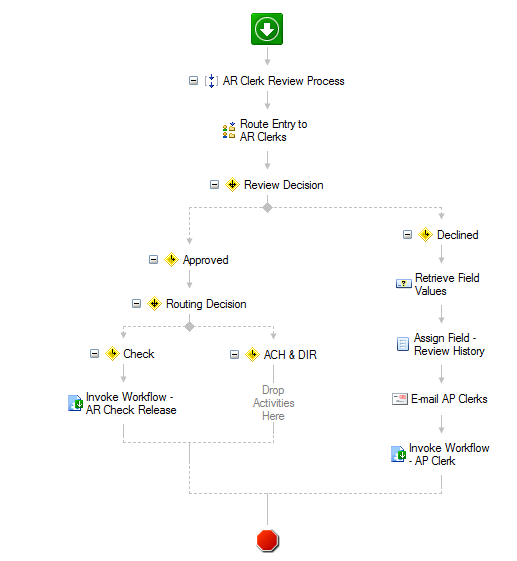 In order to make sure that every AP clerk has the same workload, a workflow was created that evenly allocates payments into each AP clerk’s working folder. 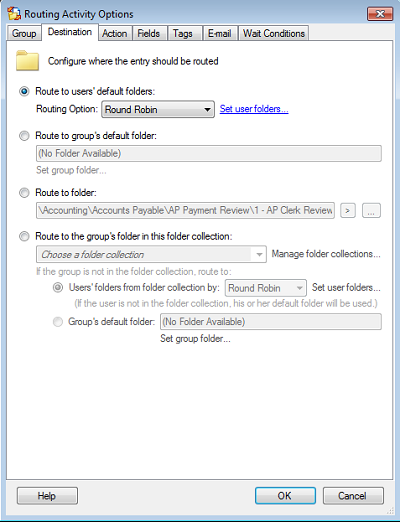 In order to accomplish this, the “Round Robin” routing option is used when configuring the “Route Entry to Group” activity. Each AP clerk is responsible for linking the supporting invoices and billbacks to each payment and reviewing it for accuracy. 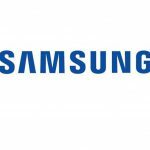 Once the supporting documents are linked and the payment has been reviewed and deemed correct, the AP clerk changes the value of the “1.2 – AP Clerk Review” field to “Approved”. Alternately, the payment can be routed to the AP supervisor for further review or put on hold. In either case, the clerk provides an explanation in the “1.1 – AP Clerk Notes” field. The clerk can also tag the payments with the “Remittance on Spreadsheet” tag (if the payment needs to be mailed to an address other than the one on the invoice) or “Special Handling” tag (if a payment requires extra attention such as foreign postage). If either of those tags is applied, Workflow applies a sticky note or stamp respectively letting the accounts receivable clerks know to take this into consideration during their review. 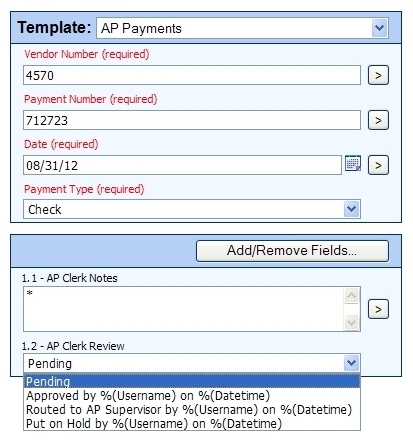 Payments routed to the AP supervisor can be voided or routed back to the AP clerk who originally routed them. Payments that have been approved by the AP clerk are automatically routed to the accounts receivable (AR) department for an audit review. The same “Round Robin” option is used to divide work evenly among the AR clerks. The AR clerk can approve or decline a payment by changing the value of the “2.2 – AR Clerk Review” field. If a payment is declined, it is sent back to the AP clerk who originally approved it so that he can either make corrections or route it to the AP supervisor. Once the AR clerk approves a payment by check, it is routed to the “AR Check Release” folder for the person who releases the physical checks. From there, the AR clerk either releases or voids the check by updating the value of the “3.2 – AR Check Release Review” field accordingly. No physical check is released to be mailed until the digital version in Laserfiche has both the AP and AR clerks’ approvals. Note that throughout the entire process the original documents are stored in separate vendor folders, with the clerks and supervisors only dealing with document shortcuts. These shortcuts are automatically deleted once the clerks have completed their review. The benefit of using shortcuts is that the original version is always stored in one standardized location and cannot be accidentally deleted or misplaced. AP saves 20 cases of paper each year. AP was able to convert the group’s “working desk” into a desk for another team member. Invoices and payments are no longer manually sorted among the AP and AR clerks—resulting in everyone having the same workload. Instead of searching through manually printed and filed paperwork, AP clerks can easily work invoices and review payments directly from the digital copy in Laserfiche—saving time and resulting in a more efficient process.